Ashley Hall, South Carolina’s only independent girls’ school, has launched the state’s first Horizons tuition-free summer education and enrichment program partnering with Memminger and Mitchell Elementary Schools. By delivering the award-winning national program on its urban campus with experienced faculty and student mentors, Horizons at Ashley Hall will provide Charleston 1st and 2nd graders with transformative summers through the 8th grade with math, reading, swimming and the arts and a proven pathway to high school graduation and college acceptance. “At a time when girls’ voices and leadership are more important than ever, Ashley Hall is enormously proud to be contributing to a pipeline of talented and confident girls in this great city. It is an honor to be partnering with our friends, families, and leaders at Memminger and Mitchell Elementary Schools to create a shared community of success for Charleston’s future generation of girls,” said Ashley Hall Head of School Jill Muti. Ashley Hall’s inaugural year in Horizons welcomes 30 rising 1st and 2nd graders who will return to the program each summer through 8th grade, ensuring the continuity that has led 97 percent of Horizons students to graduate high school and 91 percent to go on to college or other post-secondary institutions. A new class of 15 rising 1st graders will be added each year. Ashley Hall, a premier independent school in the Southeast for girls, is dedicated to deep learning, healthy development, high achievement, and community impact. Founded nearly 110 years ago as a groundbreaking college preparatory school, Ashley Hall today is investing in local and global expansion, academic innovations, and meaningful community connections such as Horizons. Horizons’ positive impact starts by reversing the “summer slide,” or student learning loss, that has been documented to especially affect lower-income children. 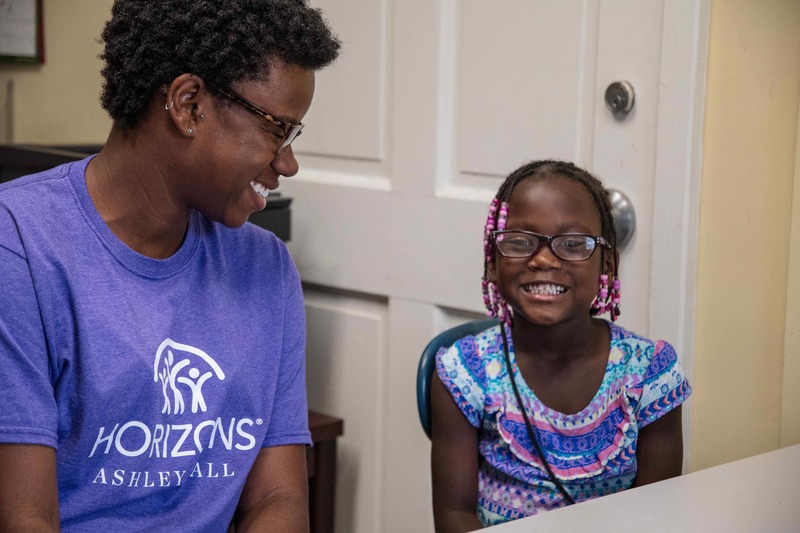 Horizons students advance 8-12 weeks in reading and math skills over the course of the daily, six-week program – a gain that when added to the summer slide the students avoid, leaves them well ahead in learning proficiency. Key to the program’s development and launch was a close collaboration with Memminger Elementary Principal Abigail Woods, Mitchell Elementary Principal Deborah J. Smith, and the parents of Horizons students to ensure that the program meets their needs while delivering on the Horizons model. Enhancing the program is Ashley Hall’s own student-centered approach that encourages curiosity, healthy risk-taking, and personal achievement. The local Horizons program is further supported by Ashley Hall’s own student volunteers. With a 5:1 student-to-faculty ratio, the resulting program is a playful curriculum of math, reading, sports, and the arts, augmented by field trips, healthy lunches, and an overall emphasis on family involvement. Swimming, taught in Ashley Hall’s historic Madren pool, is a core Horizons activity, valued for its life-skills and confidence-building qualities. Steering the program with decades-long experience in Horizons’ best practices is Kiki Sweigart, Ashley Hall’s 5th grade science and math teacher. Having joined Horizons’ first program in 1974 in Connecticut, Sweigart expanded the initiative to Washington, DC in 2000, and now serves as Horizons at Ashley Hall’s program director and lead teacher. “Multi-year mentoring and an ongoing commitment by the parents and students are hallmarks of the Horizons program and provide a foundation for its proven success,” Sweigart said. “By building a long-term network of friendship and guidance, we are creating an enduring foundation for our Horizons students’ personal and academic success as they enter teenage years and adulthood,” Eric Strickland, Executive Director of Horizons at Ashley Hall, added. Horizons National is an award-winning, tuition-free, academic and enrichment program serving 6,000 low-income, public school students on the campuses of 56 independent schools, colleges, and universities across the country. Its high school graduation rate of 97 percent compares favorably to the national average of 83 percent but is particularly impressive in the context of the low-income students that Horizons focuses on, whose national graduation rate hovers near 75 percent. Horizons at Ashley Hall runs from June 18 through July 27 and will return each summer for children from 1st–8th grades, with ongoing communications and support for its graduates.